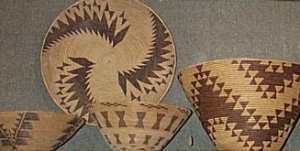 Among the arts and crafts practiced by the Indians, basket making was one at which the Maidu excelled. A rare and impressive collection is on display at the Plumas County Museum. Both coiled and twined baskets were created incorporating designs usually suggested by natural themes. Materials were gathered throughout the year from favorite locations, and much care was taken in their preparation. Parts of various species were used, primarily those of willow, red bud, yellow pine, bear grass, and bracken fern. Beadwork was another important craft with the Maidu. It was valued as a decoration as well as a medium of exchange to barter for other items. Fires were set in the fall months when rains were sure to control them. The snags and brush around maple trees were burned to promote growth of new shoots for basketry. Fires set in grass and brushlands as well as in forests helped promote easier travel, hunting, and production of better crops of wild food plants. Commerce trails were numerous in Maidu country, and items of trade flowed freely over them. From the valley, beads reached the mountains, along with salmon, salt, and nuts of the digger pine. In turn, the mountaineers traded bows and arrows, deerskins, and sugar pine nuts, as well as acorns. Obsidian for arrows was obtained from the Achomawi to the north.